Green Bike Lanes on the South Street Bridge will be here soon. Later this week, Streets Department crews will begin painting the bike lanes on the west end of South Street from 33rd St to Convention Ave. In October, crews will painting the bike lanes on the bridge. Work on the project is expected to be completed by the end of October (weather permitting). Bicyclists should expect intermittent bike lane closures during the project. 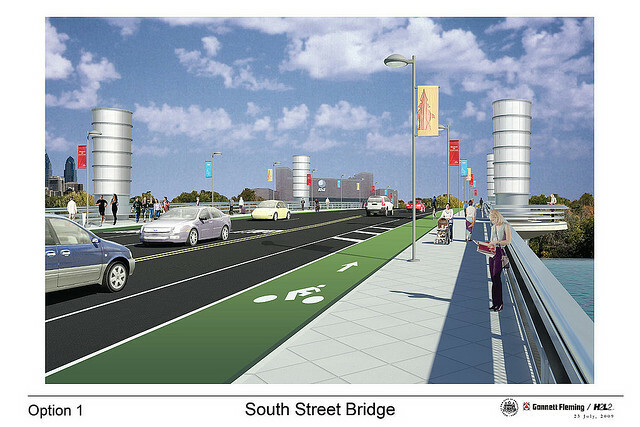 Sunny Days on the South Street Bridge, reading a book and riding on green bike lanes. Any chance the city can spend money on the green paint at intersections where it is actually needed? 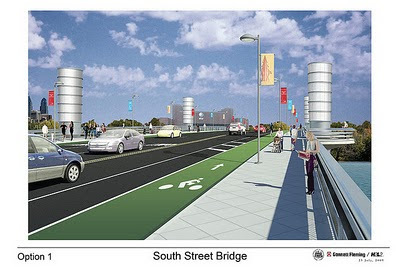 The South Street bridge is already relatively safe yet intersections like Spring Garden St and Pennsylvania Ave or Spring Garden St and the I-76 ramps (I could go on listing more) really need some more clarification for conflicts between right turning drivers and through moving cyclists.